Igor, I’m glad you’re feeling cheerier than last year, various ailments notwithstanding. Isn’t the human body fascinating? I must admit I did not know an eyeball could swell like that. I wonder, ought you to reconsider the bed of rock now in the light of the back pain? Ooh. Careful not to shake your head too violently, you could do yourself an injury! Good luck on the haul tonight. May your neighbours be generous with the swag, for you have earned it. And get well. For Halloe’en comes but once a year. Oh, honey. Oh dear. You sound like me, and that is NOT how you want to sound when discussing Things Medical! Perhaps next time take some diphenhydramine (Benadryl here, not sure what you lot call it) right away? Your description of the eyeball was grand (clearly I am not squeamish). You poor thing! I was very impressed with this year’s pumpkin effort, although last year’s was, as you mentioned, *much* scarier. I once had an allergic reaction – to either Chinese food or chocolate, both of which I have happily eaten before and since – that made my face resemble a duck’s bill. I wish it’d been at Hallowe’en. My GP told me that one of his friends had recently died of a shellfish allergy, and not to worry…. 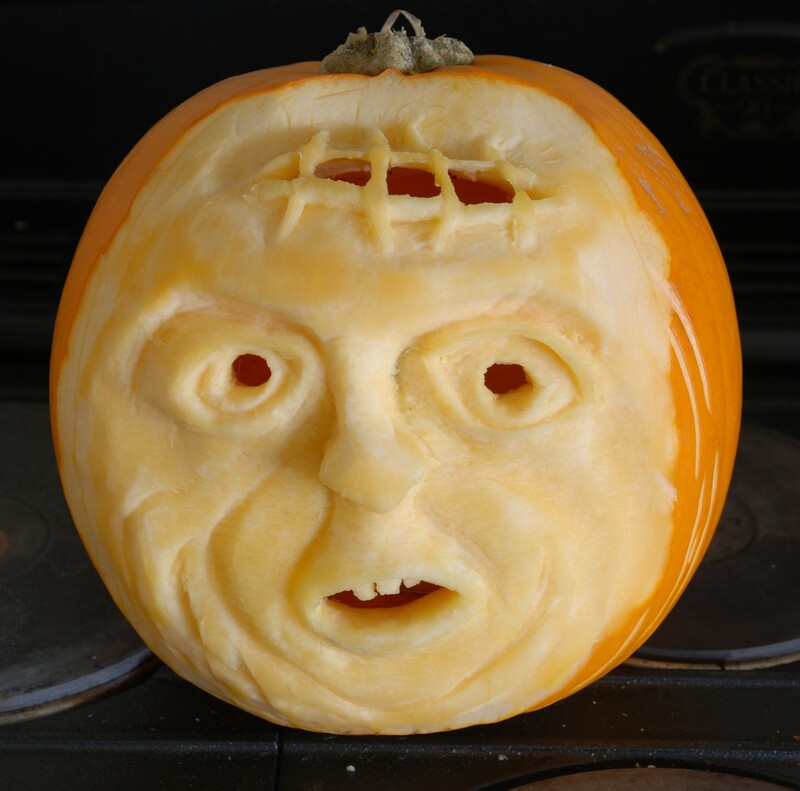 Your pumpkin-carving skills are unbelievable, by the by! So is your Halloween costume going to consist of you smearing your face with curry and letting nature do its worse? Great pumpkin. Is the Hairy Farmer going to submit a pumpkin for our appraisal as per last year? I think John has reluctantly conceded that I might have the edge in talent. I would possibly manage to amputate a limb if I tried to carve a pumpkin in that manner! Now I think you may be going too far with the whole Halloween spirit thing with the eyeball! Hope it recovers soon. Um, ewwwwwwww. Eyeballs should NOT do that. As for the rest of you, my dear girl, OW. And URGH. And OW OW OW OW. You poor mistreated ewe-lamb. You can come and be my Igor any time. Except I am now terrified of feeding you in case you burst into flame. Hope the rest of you feels better soon. But any time your eyeball (ugh!) does that (ugh ugh!) I think you deserve a day off. Not to mention the rest of the body. You’ll probably enjoy my latest post, which includes pictures of my culinary triumph – eyeballs on forks. The pumpkin is, indeed, phenomenal. The pumpkin is amazing. Well done. Sorry to hear about your eye though. I hate it when my eyes puff up – I usually get it when I dont get enough sleep and have to wear sunglasses to hide it.